When it comes to trimmers, two companies really battle it out for me. Everybody knows the legendary Andis T-Outliner trimmer. 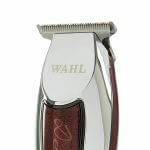 And Wahl’s premium answer is the 5 star Detailer. Sit comfortably and get ready for a real showdown: Wahl Detailer vs Andis T-Outliner. Why the GTX? Because it’s essentially an improved version! Of course, this doesn’t mean that I don’t enjoy my regular T Outliners. Hard plastic, burgundy x chrome finish. T-Wide blade for edge ups, outlines, beard trims etc. Very sharp, not as good for sensitive skin. Relatively cool, can get a bit noisy. 3 guards (1/16", 1/8", 1/4") included. 5.5", 11.02 oz. Durable polymer in glossy grey. T Outline blade for outlines, trims, necklines and dry shaves. More gentle to sensitive skin. Heats up more and runs noisier. 5.5", 11.02 oz. 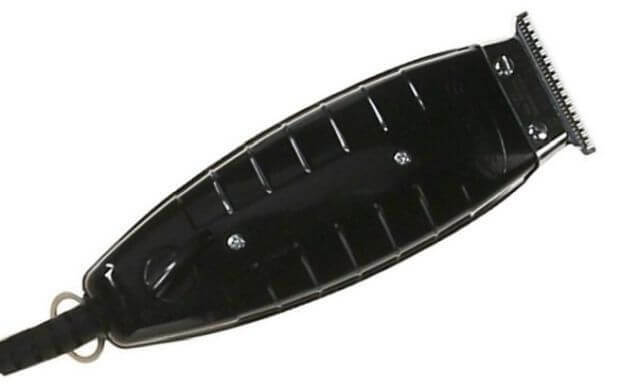 Durable polymer in glossy black. Deep tooth T blade better for thicker hair and precision work. Sensitive-skin friendly. Note: If you’re interested in standalone reviews, we have a Detailer review, GTX trimmer review and a standard T-Outliner review for you. 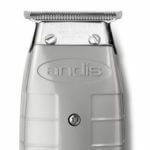 Or if you are just looking to compare the Wahl Detailer vs Andis T-Outliner then keep reading. This comparison perfectly showcases how different clipper brands approach product design. The Wahl Detailer trimmer and Andis GTX T-Outliner couldn’t be more contrasting. On one hand, you have Wahl’s typical 5 star series color combination – burgundy, with some chrome finish and a little bit of white. The Detailer trimmer is 5″ long and weights a total of 6.9 oz. You get high quality hard plastic covering the machine’s rather lightweight body, the top having a chrome finish. Exactly the opposite, the GTX features a full-on gloss back finish. It evokes an elegant feeling of roaring power hidden inside it. The GTX T-Outliner trimmer is significantly heavier at 11.2 oz. and a bit bigger too, at 5.5″. A very remarkable feature of the GTX is its long, thick cord and 3-pronged plug, instead of the standard 2 prongs. The cord is one of the reasons I think the GTX version of the T-Outliner is better than the usual one. More on that, a bit later. I’d say this Wahl Detailer vs Andis T-Outliner one is a tough comparison in the Body & Design department. Some professionals adore the heavier feeling of a T-outliner; casual users might prefer the lighter, smaller and easier to maneuver Wahl Detailer trimmer. While the Detailer’s color scheme is somehow aristocratic, the GTX evokes a feeling of raw power with its stylish black body. Now let’s go over to Wahl Detailer vs Andis T-Outliner blades and motor comparison. 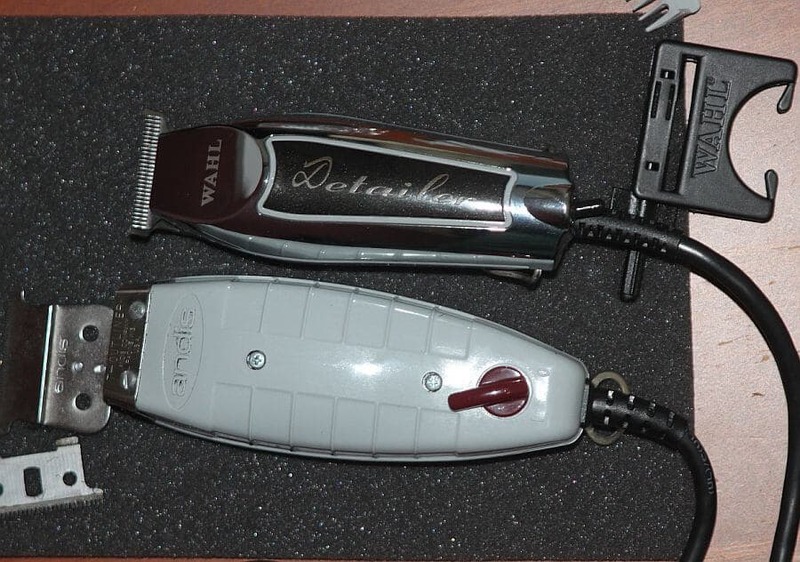 All Wahl 5 star Detailers come with a rotary motor and Wahl’s own T-wide #2215 blade on Amazon.com. Made of stainless steel, the Detailer blade is perfect for edge ups, beard trims and professional outlines. Working with mustaches is very easy too. It allows for crisp, sharp lines even if you don’t zero gap it. Speaking of doing a zero gap – something very popular with both clippers and trimmers, there’s something you need to know. 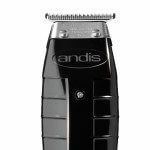 The way you zero gap a Wahl blade or do the same with an Andis blade is completely different. The Detailer’s steel blade is easier to zero gap. However, you definitely don’t want to gap it as closely as you would do with the GTX T-Outliner. Leave some more space, otherwise you risk having the Detailer blades get too sharp. No one likes getting nicked with a pointy trimmer blade.And I have to say, the Wahl trimmer does require of you to be more careful around its blades in comparison with the GTX. 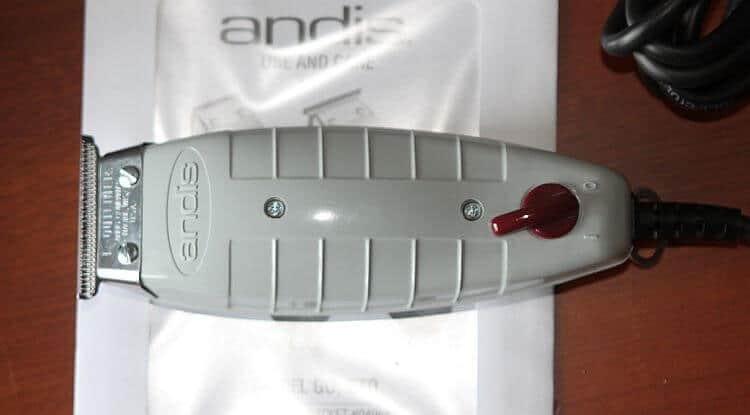 The Andis GTX T-Outliner trimmer on Amazon.com, on the other hand, features an electromagnetic motor. Running on a remarkable amount of 7200 strokes per minute, it’s an example of Andis tools’ output capabilities. It’s a double-edged sword, though, as exactly the electromagnetic motor causes the GTX to overheat. The T-Outliner blades are made of stainless steel again, with the addition of them being carbon-coated for some extra durability. While the GTX blades are perfect for outlining and trimming your beard, they are even better at cleanups – for example necklines. At the same time, shaping mustaches and narrower areas can be a bit tough due to the wider blade design. Performing a zero gap on a GTX blade is generally harder than doing so with the Wahl Detailers. The GTX blades are also a reason why I decided to skip on the classic T-Outliner. If you take a closer look at the GTX, you’ll see its blades are thicker and the teeth somewhat deeper than the standard Andis trimmer. This allows for cleaner cuts and smoother action when it comes to longer, thicker hair. The stylish black GTX significantly outperforms your usual T-Outliner trimmer here. Moving on to the next department where we can compare the Wahl Detailer vs Andis T-Outliner. Hands down, the big winner here is the Wahl Detailer trimmer. As many other Andis models, the GTX T-Outliner suffers from getting too hot at one point. While it improves on the standard T-Outliner heat issues, after 15 minutes or so it will start getting more than warm to the touch. As I mentioned, the powerful electromagnetic motor contributes to that. The Detailer might get warm eventually too – let’s face it, all hair cutting machines are like that. However, it won’t reach the GTX level. Surprisingly, but the noisier GTX T-Outliner trimmer can score bonus points for “roaring” instead of humming. For casual users, however, the Detailer might feature more tolerable noise levels. And now for the Wahl Detailer vs Andis T-Outliner price comparison let’s see the difference, if there’s any. Both models are priced very similarly, entering a slightly higher budget segment of the trimmer market. The GTX is a little more expensive than the Detailer. At first glance, the Wahl Detailer is pretty cool in terms of accessories: you get three Wahl guides (1/16″, 1/8″ and 1/4″), clipper oil, cleaning brush and the trademark red blade guard. The truth is, the Detailer blade is very specific and it will be quite hard for you to find other guards, especially longer ones. 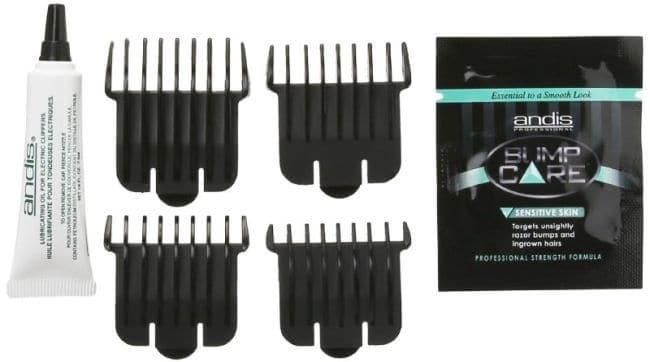 Being narrower, it straight out becomes incompatible with standard Wahl clipper guards. Guards do come in handy, as some users have complained about the trimmer irritating their skin if they use it as a close clipper instead of a trimmer. With the Andis GTX trimmer with a T-blade, it seems things differ depending on the vendor. In some cases you’ll get it with as much as 4 guards, other times you receive only the T-blade trimmer. You should carefully check with the seller you want to buy from. In any case, though, the GTX is way easier in terms of guard compatibility. So even if you don’t receive any Andis blade guards with your purchase, you should encounter no issues with customizing your GTX afterwards. It would be a cliche to say both hair trimmers are worth it, wouldn’t it? Yet this is the truth. However, they vastly depend on what you need them for. For example, the GTX T-Outliner is perfect for professionals who focus on necklines, outlines, trimming around ear areas and such. It’s heavier structure, thick cord and aggressive body design build a very powerful, “hungry” impression. The Wahl 5 star Detailer trimmer is somehow more casual user oriented. It’s lighter, quieter, all around smaller, and in fact, it even has a cordless version. Even if you need to customize it by doing a zero gap, it’s a simple process. Just remember to not put the blades too close. An additional distinction would be people who have more sensitive skin. In this case, trimming with Andis GTX T-Outliner trimmer would be a better idea. Its blades are a little gentler with the skin, even when zero gapped. Can you go wrong with any of these two? Hell no. Just think about what exactly you need them for.